Are you looking for a high-quality sports shelter to keep you and your family safe while enjoying sports from the sidelines? Do you want something that’s durable enough to last a long time without blowing away in the wind? Have you ever heard of the Light Speed Sport Shelter​? If not, you’re in the right place! In this article, we’ll introduce you to one of the best and most popular sports shelters on the market today. You’ll be able to see for yourself what makes this product such a best-seller. The Lightspeed company itself is dedicated to providing great quality products that customers will be satisfied with from day one. Although the company has only been around for seven years, they have already paved the way for some of the greatest pop-up tents and outdoor gear available. This company strives to use great materials that will withstand a lot of use so you don’t have to worry about your tents and other outdoor gear wearing out too quickly. If you’re looking to stock up on lots of products for use outside, be sure to check out the rest of the catalog available from the Lightspeed Outdoors company. You’re sure to love everything you can find and much more when you take a look at the items available from this company. And if you’re looking for something to protect you from the sun and rain when you’re attending your favorite sporting events, look no further than the Light Speed Sport Shelter we have reviewed below. You’re sure to love it! With the Light Speed Sport Shelter, you and your family will be safe and protected from the sun as well as from light rain any time you relax inside it. This shelter is designed to be easy to set up with its unique hub-style frame system, and it is just as easy to take down again when the time comes, too. This is a spacious tent that only weighs a little bit over seven pounds when it’s folded down, so you can easily carry it along with you for just about any event. This tent is bigger than many of the other, similar tents on the market today, giving you a bit more space to work with and spread out comfortably inside. The tent has three large mesh windows to make the interior more breathable and comfortable while giving you more visibility around you as well. The sports shelter comes with its own carrying bag so you can easily take it down and store it as needed when it isn’t in use. The tent also comes with all the required ropes and stakes needed to set it up safely and securely every time. We like the high-quality, durable fabric used in the production of this tent. The fabric is not only water-resistant but also waterproof, and the tent itself is even designed to encourage rain to roll off the sides without getting in through the mesh windows. All in all, this is a sports shelter that’s great for use in the wind and rain both, and since it holds up so well to exposure to water, it’s a good addition to your beachgoer gear, too. We feel that the tent really shines in its construction, and many customers have reported it lasting for years with lots of use. 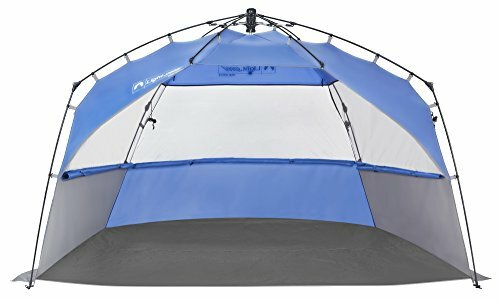 We feel that one of the biggest flaws with the design of this tent is its inability to be adjusted to different heights. The tent is very tall when set up, and on some beaches, it may be over the height limit for beach tents. Because of this, it may also be too tall to use at a sporting event if anyone behind you is trying to see over the tent. With an adjustable height option, this tent would be just about perfect, so we feel that this is an improvement that would be worth mentioning. This tent is big enough for two lounge chairs to fit inside with a little bit of room to spare, making it a great option for long-term use throughout he day. The product has been reported to hold up well in the wind and rain and to keep its color and durability strong even in the hot sun, too. The tent comes with easy-to-follow directions for assembly and setup so you don’t have to guess at how to take care of any of it. The mesh windows work very well and keep everything cool and breathable on the inside of this tent. Some customers have reported that shorter owners may have trouble putting this tent together since it is very tall in the center. Rarely, some products have arrived put together incorrectly so that the tent cannot open correctly and, therefore, can’t be used. In some instances, if the wind is very strong (such as during a storm), the legs on this tent could snap and become damaged beyond repair. Putting the tent back down for storage may be more challenging than setting it up and will likely require two adults to manage properly. So what do you think? Have you decided whether or not the Light Speed Sport Shelter is right for your needs? This pop-up tent is a great addition to your regular sporting event gear collection, especially if you’re the type of person who likes to watch from the sidelines or do a lot of tailgating. This product is easy to set up and take down as needed, and it’s big enough for more than one person to share comfortably. For these reasons alone, it can be helpful to keep on-hand in your vehicle for any time the mood may strike. Of course, there are other situations in which you might want to use a sports shelter like this one, too. You might want to bring it along to the beach, for example, to give yourself and your family some protection from the sun’s rays. It may also be a nice way to relax outdoors on your next camping trip, especially if you’re going to be spending a lot of time just sitting and enjoying the outdoors. It’s a popular way to prevent sunburn when going on fishing trips, for example! Bring home your new sports tent today and see for yourself all the great ways you can use it in your outdoor adventures. You may be surprised!